The mid‑sixteenth century saw the flourishing of the so‑called saz style—characterized by the depiction of stylised, serrated leaf foliage, often paired with fantastic creatures including dragons and phoenixes. This imagery appears on Ottoman art in a variety of media, including textiles. This magnificent dragon drawing is ascribed to the master of the style, Shah Quli, an artist who emigrated from Iran to Istanbul and became head of the royal atelier under Sultan Süleyman the Magnificent. Ackerman, Phyllis, Guide to the Exhibition of Persian Art. The Iranian Institute, New York, New York: The Iranian Institute, 1940: 206, no. Gallery VII; case 99D. Bernus-Taylor, Marthe, L'Etrange et le Merveilleux en Terres d'Islam. Musée du Louvre 23 avril–23 juillet 2001, Paris: Musée du Louvre, 2001: 92–93, 115, no. 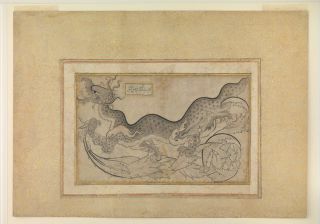 81, ill.
Ekhtiar, Maryam, Canby, Shelia R., Haidar, Navina and Soucek, Priscilla P. (eds), Masterpieces from the Department of Islamic Art in The Metropolitan Museum of Art, New York: The Metropolitan Museum of Art, 2011: 6, 287, 290–92, no. 202, ill. 291 (colour). Ettinghausen, Richard, "Islamic Art", Metropolitan Museum of Art Bulletin, 33/1 (Spring 1975): 42–43 (b/w). Grube, Ernst J., Muslim Miniature Paintings from the XIII to XIX Century. From Collections in the United States and Canada, Venice: N. Pozza, 1962: no. 78, 99–100, ill. pl. 78 (b/w). Grube, Ernst J., Studies in Islamic Painting, London: Pindar Press, 1995: 325, ill. fig. 21 (b/w). Meredith-Owens, G, Turkish Miniatures, London: British Museum, 1969: 19. 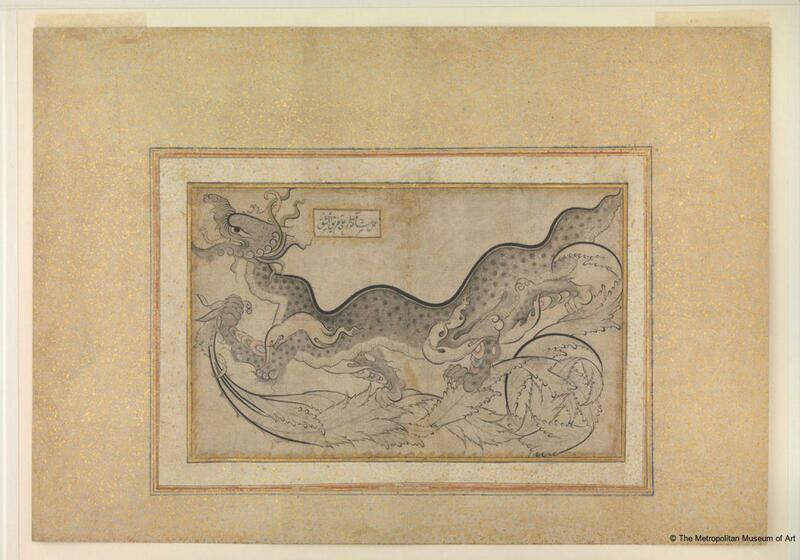 Says a dragon in combat with a phoenix in the MMA may be a work of the Persian Sahkulu but it is by no means certain. Welch, Stuart Cary, "Two drawings, a tile, a dish, and a pair of scissors," in Richard Ettinghausen (ed), Islamic Art in The Metropolitan Museum of Art, New York: The Metropolitan Museum of Art, 1972: 292, ill. fig. 2 (b/w).